One of the Columbus residents accused of trafficking in heroin in Delaware County has agreed to testify against the other defendants in exchange for having several charges dropped. Claudia Santos-Hernandez, 28, appeared in Delaware County Common Pleas Court Monday where she entered a plea of guilty to two counts of trafficking in drugs, which are third-degree felonies. As part of the deal with prosecutors, she will testify against two men with whom she was living and was allegedly selling drugs. Tomas Martinez-Lopez, 20, and Anselmo Magallanez-Robles, 26, are each facing a charge of trafficking in drugs, which is a first-degree felony; a charge of possession of drugs, a first-degree felony; four counts of trafficking in drugs, fourth-degree felonies; and a charge of trafficking in drugs, a second-degree felony. Originally Santos-Hernandez faced the same charges but the charges were reduced as part of the deal with prosecutors. She pleaded not guilty at an earlier court appearance but changed her plea Monday. Prosecutors said Magallanez-Robles and Santos-Hernandez are in a relationship. Martinez-Lopez and Magallanez-Robles were scheduled for trial today but the trials were rescheduled after Santos-Hernandez’s change of plea hearing Monday. New trial dates for the two men have not yet been set. 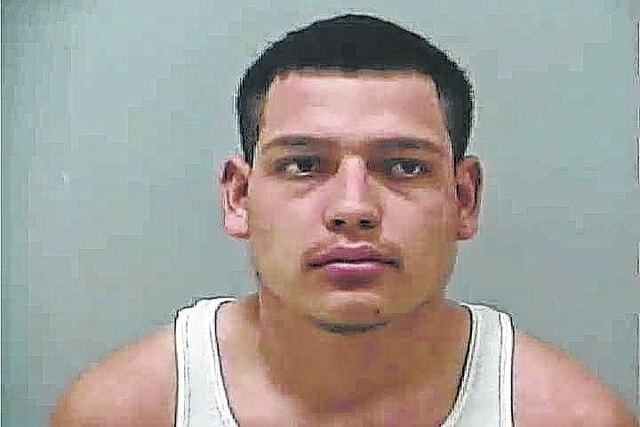 Judge Everett Krueger set a sentencing date of Aug. 17 at 9 a.m. for Santos-Hernandez. As part of the plea deal, both Assistant Prosecuting Attorney Brian Walter and Santos-Hernandez’ attorney, Thomas Waldeck, recommended that Krueger sentence Santos-Hernandez to 18 months in prison. Krueger said he is not obligated to follow these recommendations and said each of the charges Santos-Hernandez pleaded guilty to comes with between nine to 36 months in prison. Krueger added the sentences must be served consecutively. All three defendants were in the Delaware County Jail Monday afternoon. Walter said the trio was arrested April 22 when Delaware County Drug Task Force units and Dublin police executed a search warrant at an address on Valley Ridge in Columbus. Walter said none of them are U.S. citizens and do not have Social Security numbers. Walter added that investigators spoke to Magallanez-Robles on several occasions to arrange drug deals and said that Magallanez-Robles appeared at one of the transactions. Martinez-Lopez was reportedly at the other four drug deals. Walter said investigators were able to purchase more than 150 balloons of heroin — close to eight grams — during one of the drug deals. The deals occurred in a parking lot adjacent to the Best Buy store at Polaris in Delaware County, prosecutors said. During the search of the Valley Ridge residence, Dublin police said they discovered and seized more than 155 grams of heroin and more than $7,000 in cash. Walter added that when Santos-Hernandez was arrested, her arms were covered in baby oil, which Walter said is part of a process that drug traffickers use to help package heroin. Dublin police reported they also discovered packing materials used to distribute heroin in a hidden compartment in the kitchen of the apartment. Dublin police note in their reports that Magallanez-Robles attempted to break a cellphone and swallowed a balloon containing heroin before he was arrested.